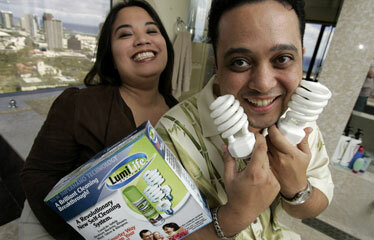 Vendors at the Home and Garden Show include John Dimitrion and wife Julie with their "LumiLife Systems" bacteria-killing lightbulbs. As the old saying goes, the future is looking bright for John and Julie Dimitrion. Owners of the brokerage firm Mortgage Alliance, the married couple will be holding court with more than 200 other vendors at the 30th Annual Hawaii Home & Garden Show next weekend. 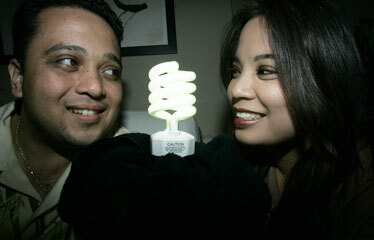 Not only will the Dimitrions offer home loan options and mortgage advice at the one-stop shop consumer show, but they'll also be featuring a new product they are backing and distributing: an Earth-friendly, energy-efficient, 25-watt light bulb that rivals the output of standard 100-watt bulbs. "This is the first time we've participated in the show so we are excited," said John. The LumiLife Systems lamp is a light bulb designed to destroy mold, bacteria and allergens with a flick of a switch and a spray. When coated with a layer of titanium dioxide, the light bulb's cleaning properties are activated, destroying airborne microorganisms when the lamp is lit. As in years past, the three-day Home & Garden show will feature a variety of products and services. This year's offerings include the latest in custom home and garden designs, electronics, furnishings and cleaning services. Participants include Essential Cabinets, ABC Design Center, Aroma Sensations, China Treasures, Kitchen Craft, Pods Moving and Storage, Ray's Solar Fans and more. 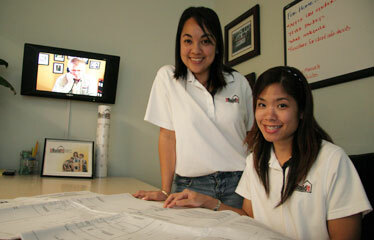 Also taking part are the owners of UBuildIt, Maile Shimabukuro-Pasual and Denise Nakasato. The franchise offers assistance to homeowners looking to manage the job of remodeling or building a new dwelling from the ground up. "The underlying principal is that a homeowner can handle any type of project," said Shimabukuro-Pasual. "It's less expensive than hiring a general contractor." In addition to vendors, there also will be plenty of giveaways throughout the weekend, including scratch-and-win tickets with cash prizes between $500 and $1 million. A minimum of $3,000 will be donated from ticket sales to the nonprofit social service agency Ka Hale Hoala Hou No Na Wahine. Maile Shimabukuro-Pascual, left, and Denise Nakasato, of UBuildIt, a service company that helps people build or remodel their homes.